When a cusp becomes weakened, a fracture may result. The cusp may break off or be removed by a dentist. A fractured cusp rarely damages the pulp, so a root canal may not be necessary. Your dentist will usually restore the tooth with a full crown. This type of crack extends from the chewing surface of the tooth and vertically migrates towards the root. In some cases, the crack may extend below the gum line. It is possible for the crack to extend further into the root. Damage to the pulp is common and root canal treatment is usually necessary. 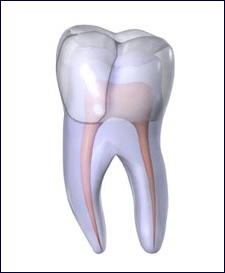 A cracked tooth that is not treated will worsen, resulting in the loss of the tooth. Therefore, early detection is essential. A split tooth is usually the result of an untreated cracked tooth. It can be identified by a crack with distinct segments. If possible, the cracked part of the tooth is removed, and the tooth is restored with a filling or crown. 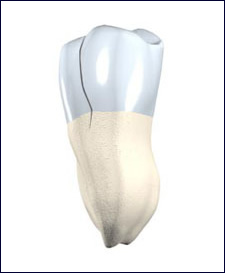 However, if the crack extends below the bone, the tooth will need to be extracted since these cracks cannot be repaired. A vertical root fracture begins in the root and extends towards the chewing surface of the tooth. Unfortunately, they often show minimal symptoms and may go unnoticed for the some time. Vertical root fractures are often discovered when the surrounding bone and gums become infected. Treatment usually involves removal of the entire tooth. Occasionally, endodontic surgery can be an appropriate option to save the tooth.